Nothing is more important than protecting your family and home. And while it can be challenging to protect your home from professional thieves, studies show that most home burglaries are carried out by amateurs. These thefts are more easily prevented if you employ some of these simple tips for home security in Orlando. Plan to rob yourself. You’ll discover any weaknesses in your security system that may have previously been overlooked. Lock up your home, even if you go out only for a short time. Burglars have been known to just enter through an unlocked door or window. When you move into a new home, immediately change all the locks and tumblers. For the most effective home security in Orlando, hide all wiring. A professional burglar looks for places where he or she can disconnect the system. Make your house look occupied at all times. Use timers to switch lights and radios on and off when you’re not there to ensure your home security in Orlando. If you have a defective alarm that frequently goes off, get it fixed immediately and alert your neighbors that it’s been repaired. Many people ignore an alarm that goes off periodically, thinking that it’s just faulty. A spring-latch lock is easy prey for burglars who are experts at slipping a plastic credit card against the latch tongue to depress it and unlock the door. A deadbolt wards off any such attack. It is only defenseless when there is enough space between the door and its frame to allow an intruder to use power tools or a hacksaw. If your keys come up missing, change the locks immediately. Before turning your house key over to a professional house cleaner, make sure the person is honest and reputable. Check all references thoroughly and if the house cleaner is from a firm, call your local Better Business Bureau to check on the firm’s reputation. Instead of keeping a spare key in a mailbox, under the doormat, or on a nail behind the garage, wrap the key in foil and bury it where you can easily find it if you need it. Don’t leave notes for service people or family members on the door as these act as a welcome mat for a burglar. If the entrances to your home are dark, consider installing lighting with an infrared motion detector. Most thieves don’t want to be seen trying to get in a door. Talk to your neighbors about any suspicious people or strange cars you notice in the area. To keep your tools from being stolen, paint the handles, as thieves typically avoid items that are easily identified. Trees located near windows or shrubbery that can shield a burglar from view can be a major flaw in your home security in Orlando. Consider your landscaping plan in light of your protection needs. Ask for credentials from any sales-person who requests entry to your home. Ask that their ID be pushed under the door. Many professional burglars use this cover to check out homes and if in doubt, check with the person’s office before letting him or her in. If someone comes to your door asking to use your phone for any reason, keep the door locked and make the call yourself. Dogs are good deterrents to burglars. Even a small, noisy dog can be effective because burglars do not like to have attention drawn to their presence. 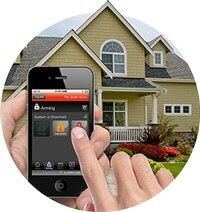 After reading our tips for home security in Orlando, how effectively do you think your home is being protected? If you’re unsure – or if you’d like solid advice from a home security expert – call our office today to schedule a consultation. Don’t wait until your home has been violated to protect it!